Here's how to get the word out. 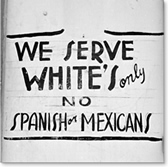 Restaurant sign, Dimmitt, Texas, 1949. Russell Lee. Center for American history, UT-Austin. The simplest thing you can do to promote your event is to create and send an email blast. We recommend you send out the email twice: two weeks before, and then a reminder several days before your event. If your organization has a website, be sure to post information about your event there, and ask any co-hosts to do the same. Post flyers in your community. Download the A Class Apart flyer to advertise your event. Make copies (in color if your budget permits) and post them in high traffic areas, such as college campuses, shopping malls, grocery stores, churches and recreation centers. Ten days before your event, send a press release to local media outlets, including ethnic media. Try to target reporters covering civil rights issues, and customize your press release to highlight the film's relevance to your community. If your event will feature prominent panelists or local heroes, make sure to mention them. including local news, public affairs programs, talk radio and Spanish language stations. Let them know about your event, explain its importance to your community, and if possible direct them to a local expert or advocate who can be available for interviews. Try contacting assignment editors (for local TV news) or producers (for public affairs programs or talk radio).